Kathy writes under the name Joy Everafter. 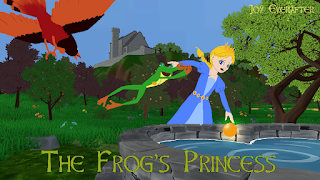 “Get off me, Frog.” The princess prised him off and stood. Couldn’t she see he wasn’t a frog? Francis hopped up and grabbed at her skirt hem. Oops, he got green on it. “It’s okay, I’m a prince. Prince Francis of Olden. You kiss me, whammo, I turn back.” And the sooner the better. He’d been dodging foxes and weasels all afternoon and he’d never survive a night out here. “Master Frog, you’ve been bewitched.” She wasn’t even looking at him, she was lifting a stick off the ground. She lay on the low stone wall and circled her stick in the well. All she was thinking about was her Golden Orb.